Tip 1: Keep It Simple! The kitchen pictured below looks amazing and I know the homeowners love it. However how much did it cost? How could they have saved money on this beautiful design? First off, look closely and you will see that the customer picked an expensive edge profile. A square polished or eased edge profile isn't considered an upgrade at Latitude whereas the edge profile in the picture costs $45 per linear ft. If you have 30 feet of edge, that beautiful scuplted edge profile just added $$1,350 to the cost of your counter top. Don't get me wrong, if you like the edge profile and you can afford it, go for it. I did and I love how it looks in our kitchen. However, if you are looking to save money, then stick to a square polished or beveled edge. Tip 2: Size and Shape Does Matter! Different materials come in different sizes. Some products are only available in 120" X 56" whereas other products are available in "Jumbo" slabs 130" X 63". When we cut your counter top, we lay the counter top pieces out to get the best yield from the slabs. If you picked a directional granite (a granite colour with lots of movement and veins) then we need to try and book match your counter top wherever two pieces meet. This can lead to a lot of waste which you will be paying for. That beautiful arc on the island in the kitchen above looks great but is expensive to fabricate and also creates additional waste. If you have a large island or want fewer seams, then an extra man charge to install that large heavy piece in your home. Extra man charges start at $200 and up depending upon the installation. Your counter top is priced by the square foot. If you stick to rectangular pieces as much as possible, then you will save material and money. If you have the budget and you want the look of flowing curved lines, then definitely do it. We can create any curve you want. Now this is a really tough piece of advice for a counter top fabricator to give you. Why? Because we make so much money on these counter tops! Boy oh boy, our accountant just loves it when you buy exotic granites and marbles. Exotic granite and marble are like a piece of art. Exotic granite is truely a work of nature at its finest! No man made product can come even close to matching the work of mother nature. However, fabricating these materials is difficult. They are usually soft and brittle. 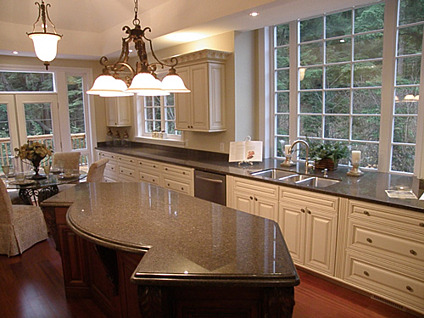 Exotic granite counter tops can easily break in the manufacturing process or in installation. Every manufacturer in the world has a whole yard full of beautiful pieces that broke. Now that's great if you are after a remnant piece. (My wife found a beautiful piece of Cosmos 9' long hidden amongst our remnant pieces. It now sits in our ensuite bathroom and we love it.) However, it is unlikely that you're going to find enough material for a standard kitchen. Because of manufacturing and installation problems, every fabricator increases their profit margins and their waste factors when calculating the price of your counter top when you select an exotic or difficult to work with material. In fact, we won't even manufacture some extremely high end products. Instead, we will refer you to an artisan who specializes in fabricating exotic granite or marble counter tops. If you are on a tight budget, then these high end materials aren't for you. There it is! My top three tips for saving money on granite counter tops! 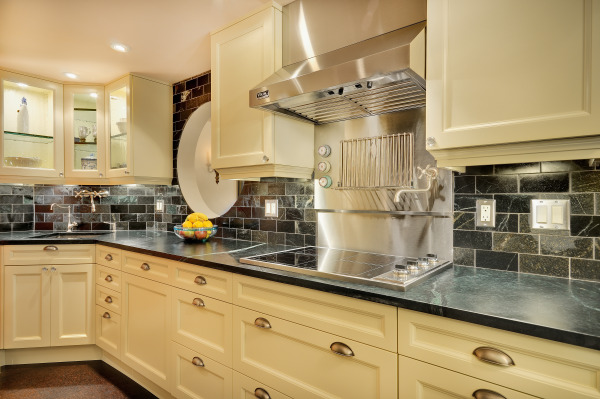 If you are looking for more information on planning and designing you kitchen, I suggest you visit Kitchen Design Tips for some great planning advice and more on Granite Counter Top Pricing or you can visit one of our dealers located across Ontario. How Much Does a Granite or Quartz Countertop Cost? This is by far the most frequently asked question. It is also the most difficult question to answer due to the variety of kitchens, styles, options and materials. But I really wanted to give one straight forward number that most people can use to estimate the cost of their granite or quartz countertop. To calculate the average square foot price, I looked back over the past year and divided our sales by the total square footage we sold to determine the average square foot price. The average retail price I came up with was $80 per square foot of counter top. Since we are in Canada, I thought I should also calculate the price in meters, which is $861.12 per sq. meter (one meter is 10.764 sq. feet). What do I get for $80 per square foot? What does the average retail price of $80 per square foot of countertop include? This price includes all the standard stuff you need in your typical granite countertop kitchen installation: granite or quartz material, templating, installation, travel (if required), sink cut outs, edging, plywood (if required) stove cutouts, fridge cutout and faucet holes. How come my Uncle Vinney only paid $45 per square foot for his granite countertop from you guys? Well, we liked your Uncle Vinney better than you…. Just kidding! What my old prof meant by that quote was that statistics is bit of an art and a science. You can make numbers say almost anything you want to if you try and are blessed or cursed with the knowledge of statistics. The $80 per square foot of countertop price I’m using here is an average price. Some granite countertops sold for more and some for less. If you buy a remnant granite countertop directly from our factory you will pay less. If you pick a beautiful Louise Blue granite, you will pay over $200 per square foot. In the end, the price really comes down to what material and edge profiles you choose as well as the features and options you want as well. All I’m saying is that each year Latitude makes over 4,000 countertops and on average our customers pay $80 per square foot. When you are shopping for countertops you shouldn’t just focus on price. Price is only one part of the total value proposition. Even Walmart doesn’t compete only on price. Walmart also includes selection and availability in its value proposition. How long will it take to have your countertop installed? Can the countertop company template without you removing your old countertop first? What does the countertop guarantee and for how long? Can I pick my granite slab or does the countertop company pick it for me? How long will the company hold the granite slab I picked? What have other customers said about the company? How long have they been in business? The company guarantee isn’t worth anything if the company isn’t around next year. Do I trust the company to make it right? If you are in the middle of budgeting your kitchen renovation or estimating the granite countertop for your new home, all you have to do is calculate the square footage of kitchen countertop and multiply it times $80 and that is approximately what you will pay for your granite or quartz countertop. Most kitchens today are around 35 square feet, so you can expect to pay around $2,800 plus taxes for your countertop. Depending on your options and the material you chose, you may pay less or a lot more .... and remember what my prof said about statistics.